by Lutgens, Frederick K.; Tarbuck, Edward J.; Tasa, Dennis G.
For introductory physical geology courses. 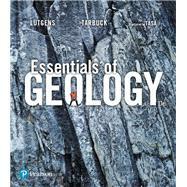 From the renowned Lutgens/Tarbuck/Tasa team, the 13th Edition of Essentials of Geology continues to elevate the text’s readability, illustrations, and focus on basic principles. This revision incorporates a structured learning path and reliable, consistent framework for mastering the chapter concepts. With a fully integrated mobile media program that includes new Mobile Field Trip and Project Condor quadcopter videos as well as new animations and videos, this edition provides a unique, interactive, and engaging learning experience for readers. Essentials of Geology , 13th Edition is also available via Pearson eText, a simple-to-use, mobile, personalized reading experience that lets instructors connect with and motivate students — right in their eTextbook. Learn more. Lutgens and Tarbuck published their first college text, Earth Science, in 1976. That book, winner of the McGuffy Award from the Text and Academic Authors Association, is now going into its 15th edition. In 1983, as the 1st edition of Earth was being prepared, gifted geology illustrator Dennis Tasa joined the author team. Since then the three have collaborated on more than twenty projects. Not only do Tarbuck, Lutgens, and Tasa work well together creatively; they also enjoy spending time in the Sangre de Cristo Mountains near Tasa’s New Mexico studio.